HEBRON (Ma’an) — Israeli forces raided and ransacked a Palestinian radio station early Wednesday morning in the town of Dura in the southern occupied West Bank district of Hebron, detained five of the station’s employees, and ordered it to be closed for three months, amid a documented escalation of violations against media freedoms by Israeli forces in the occupied Palestinian territory. 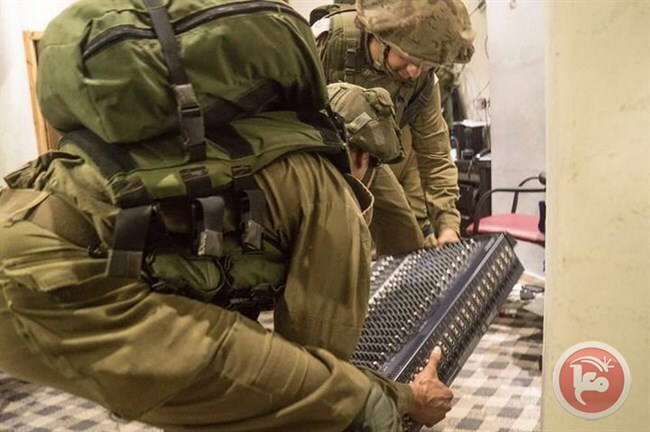 Locals told Ma’an that Israeli forces raided al-Sanabel radio station, destroyed its contents, and confiscated transmission and broadcast equipment. Israeli forces left a closure order on the door of the radio station. Locals added that Israeli forces detained head of the radio station Ahmad al-Darawish, as well as radio employees Muhammad al-Sus, Nidal Amro, Muntaser Nassar, and Hamed al-Nammura after raiding their homes. Israeli army spokesperson Avichay Adraee said in a statement in Arabic that Israeli forces, police, and civil administration authorities closed al-Sanabel upon a military order claiming that the radio station broadcast programs inciting against Israel. Adraee added that the five detainees were transferred for interrogation. News of the closure came after Palestinian press freedoms watchdog MADA released a report on Saturday saying Israeli violations against media freedoms in the occupied Palestinian territory increased by 17 percent during the first half of 2016. MADA General Director Moussa Rimawi said in the semi-annual report that while the total number of violations by both Israeli and Palestinian authorities declined from 224 cases in the first half of 2015 to 198 in the first half of this year — a rate of 12 percent — Israeli violations continued to climb, as Palestinian authorities committed 41 percent less violations during the same period. A total of 133 violations committed by Israel were recorded during the period. The most common types of violations committed by Israel were physical attacks, arrests, confiscation of equipment, prevention of coverage, and detentions. The report highlighted that Israeli authorities closed two media institutions — Falastin al-Yawm and TransMedia Production Company — after ransacking and confiscated equipment from their offices in March. Meanwhile, some 23 journalists and media workers were detained between January and June of 2016.